The Bradley tennis team dominated its match at Valparaiso this past weekend, winning 7-0. The team completed a road sweep against a Missouri Valley Conference opponent for the first time in program history. The victory also guaranteed Bradley a winning record for the first time since the 1992-93 season. The Braves are currently 12-7, two wins shy of tying the program record for victories in a season. Head coach Matt Tyler credited the accomplishments to the culture the team has adopted. Tyler said the team’s focus is playing together and bringing a positive mindset every time on the court. 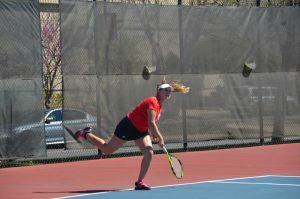 To begin competition on Saturday, Bradley swept the three doubles matches, losing only one game. Junior Natalia Barbery and sophomore Sandra Maletin then took the No. 1 match 6-0. In the No. 2 match, freshmen Bozana Lojpur and Nikki Perlwitz won 6-1. The No. 3 match ended with redshirt junior Lindsay Haight and senior Malini Wijesinghe winning 6-0. Perlwitz attributed the team’s doubles success to a better approach. The Braves found similar success in the singles matches, winning all six of them. With straight-set victories from Maletin, Wijesinghe and Lojpur, Bradley claimed the team victory. No. 1 Maletin and No. 2 Lojpur became the sixth and seventh players in Bradley history to win 20 singles matches in a season with their victories on Saturday. No. 3 singles player Wijesinghe recorded her 73rd singles victory, tying former Bradley player Teri Chan for second most career singles wins. Wijesinghe also tied Aimee Manfredo for most dual match wins in the No. 3 position in Bradley history. Wijesinghe has 12 victories while playing at the No. 3 level. Despite her success, Wijesinghe remains her humble self. She said that she plays the same way everyday and doesn’t let the milestones distract her from competing. “It doesn’t change how I feel about my tennis game, but it means a lot to have my name up there with the other really good tennis players from this university,” Wijesinghe said. In addition to the historic victories from the top three players, sophomore Nina Marjanovic won 6-4, 6-3. No. 4 Barbery took her match in three sets, winning 6-3, 0-6, 1-0. In the final match, No. 5 Perlwitz outplayed her opponent in three sets. Perlwitz won the first and third matches 6-1, losing the second 0-6. 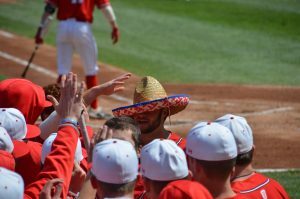 The Braves play Missouri State at 10 a.m. Sunday in Springfield, Missouri.